If you’re thinking about going camping this year, you need to make sure that you get a decent camping lantern. The best lantern for camping will provide you with a fantastic light source that you can depend on. It’s useful if you’re unable to get a fire started straight away and will also provide comfort, safety and assurance in the dark. Of course, the best camping lanterns have various benefits from extra power, to brighter lights and even various charging methods. As such, you need to choose wisely and carefully before you part with your cash. Cheaper lanterns will only last one or two seasons, plastic parts break and the batteries and connections tend to fail. Here we’ve reviewed three premium camping lanterns for you to consider, products that should last several seasons and be able to survive robust use. Are you planning on camping in an area where bad weather is a possibility? If so, then you might just want to pick up this lantern. The LED lantern is powered 8-D cell batteries. The lantern will last 75 hours, and the panel run-time will keep your campsite bright for 1.5 hours. The brilliant key feature about this little lantern is the design. 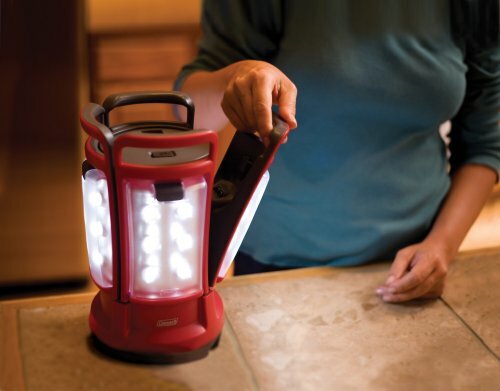 Four panels snap onto one large lantern and can be disconnected to light different areas of a campsite. You could even have one in your tent and one outside. As well as this when the lights are snapped back onto the lantern itself, they charge. As such, you can charge these lights while you’re out in the wilderness. Although, if you want the ultimate benefit this lantern provides, it’s the power. With 190 extra bright lumens, this lantern is as bright as anything. It will clearly be visible even in the worst weather you can imagine. It’s also incredibly light, and that means you’ll have no trouble carrying it around camping. That said, despite its clever design the battery pack on this lantern can feel like the jaws of life. You’ll struggle to disconnect it for recharging, and it can be rather fidgety, particularly if you’re camping in the middle of the forest. As well as this while it’s working, the lantern is fantastic, but if the lights fail, it’s a pain. You might also find that it’s only really effective when you have the panels disconnected from the lantern. As well as this, you’ll have to come to terms with the fact that you can’t charge it by plugging it into the wall. Instead, you need to buy rechargeable batteries. 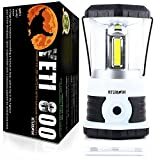 If you’re looking for a bright lantern that can light up various different areas of your campsite, this is the one for you. It will provide you with a super bright light that will ensure you can spot your campsite from miles away. You just need to make sure that you do get to grips with getting the lantern open and get used to the design before you take it out in the woods, being sure to check the batteries. If you prefer charging your lantern with a power outlet, you might be more interested in the BioLite NanoGrid. This lantern can be charged by USB or a typical plug and will provide you with light for up to 72 hours. That’s quite similar to the LED lantern we have just reviewed. It’s another lantern that gives you different sources of light. Except for this time, the two other smaller lights don’t snap into a main lantern. Instead, they are completely separate but can be connected by a wire. 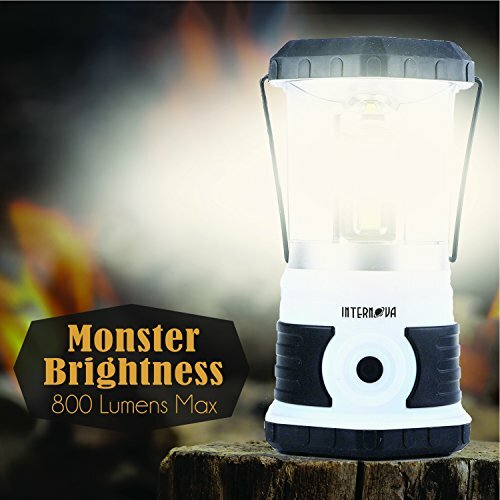 Depending on how you use the lantern, the light is quite bright with a range of up to 10 or 100 meters depending of whether you use the lantern or the connected torch. One of the great benefits of this lantern is that you can buy two or more and connect them all up. As such, they can all be charged and connected to the same powerlight source. 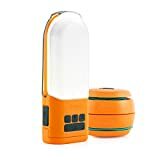 The lantern is also easy to carry and lightweight, but perhaps the most unique feature is that you can use it to charge your phone too. So, as well as keeping your campsite lit, you’ll also stay connected to the outside world. While it isn’t wireless, there’s plenty of cord to spread the other two lights to different areas of the camping ground or tent. Checkout the brief video below from the marketing folks at Biolite, it’s a bit fluffy but it does demonstrate the modular ability and charging function of the NanoGrid. It’s not all good though and one of the major disadvantages of this device is that it is quite expensive. It’s quite a lot more expensive than the Coleman lantern, and it doesn’t have the same extensive battery life. As well as this, unlike the Coleman lantern, it’s not waterproof, and this could lead to serious issues in bad weather. The difficult controls make this a recommendation for only those who quickly get to grips with technology. The fact that the lantern is not water resistant is also a little unfortunate, particularly given its price. 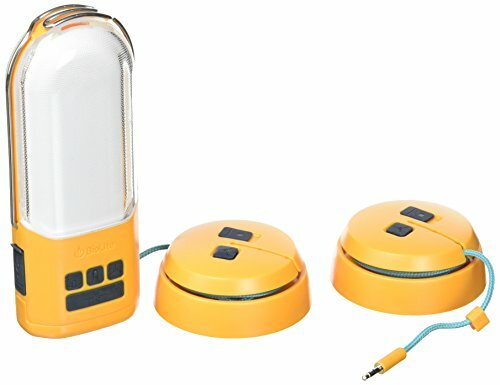 However, in the modern age of staying connected some people will find this lantern worth the extra money, purely because it has that capability to charge their phone and light up the campsite at the same time. It’s also a beautiful piece of design and many will purchase purely based on this fact, indeed we’ve included it within our best camping gift list. The Internova Yeti 800 lantern is powered by LEDs and is a great traditional lantern It’s extendable hanging hook means that you can hang it from a tree or even the roof of your tent. It’s also incredibly durable, built to withstand harsh weather as well as falls, bumps, and tumbles. As such, you won’t have to worry about it getting damaged on long camping trips. With 800 lumens output, it is one of the most powerful tools on the market by far. Regarding advantages, it’s rugged design is perfect for any camping terrain, weather or climate. While the specs suggest that the lantern only lasts for five hours, depending on use, it can be a lot longer, and it could easily provide a full weekend of light on a camping trip. In fact, you might find that it could last an entire week on just four batteries. Arguably the biggest negative about this lantern is that it doesn’t have the innovative or interesting features of the other two. In fact, it’s a fairly basic design. You can’t disconnect the light panels to spread it around your camp or use as separate torches. Nor can you charge your phone. As well as this compared to the other two the battery life isn’t that impressive, and for the price perhaps that’s is a significant factor to consider. As comparatively, it’s similar in cost to the Coleman that will last for far longer overall. While basic and somewhat traditional, the rugged features of this lantern make it a worthy choice. Although the battery life isn’t as long as others on the market and it doesn’t have the wow factor of some other designs it will provide you with the light you need on your campsite. Final Verdict – Which is the best lantern for camping? Ultimately, the final verdict here is that the Internova Yeti 800 is the best lamp overall. It doesn’t have any frills but is rugged and just does what you need it to do more than adequately. You might be tempted to try out the cool new features and contemporary designs of the other choices. But the high price of the BioLite Nanogrid doesn’t match what it offers. Still if this isn’t your sole source of light and is going to be part of a larger camping gear kit then it’s well worth looking at. Gadget freaks will love it. Meanwhile, the Coleman lantern, while offering an impressive design, isn’t as reliable as it should be. You’ll also need Arnie like muscles just to change batteries. For some though the 4 panel design will make sense and if you’re a Coleman fan then there’s plenty to like. The fact is with the rugged Internova Yeti 800 you’ll have enough power for a few days camping and a lantern you can rely on. A couple of these will adequately light a large camping tent.